OTTAWA, March 07, 2018 (GLOBE NEWSWIRE) — Skills/Compétences Canada(SCC), a not-for-profit organization that actively promotes careers in skilled trades and technologies, is proud to announce that the Gene Haas Foundation and Thomas Skinner have renewed their partnership with Skills/Compétences Canada in support of the Skills Canada National Competition (SCNC). The next Skills Canada National Competition will be held June 4 – 5, 2018, at the Edmonton EXPO Centre. 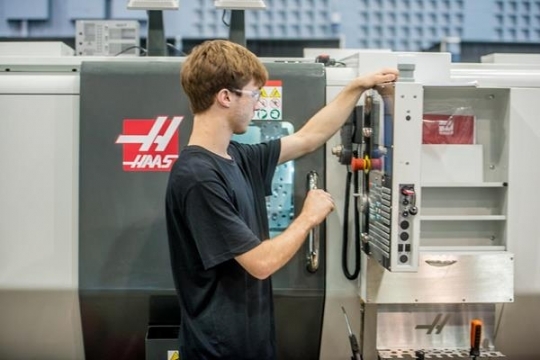 Haas Automation through its Canadian-owned factory outlets – Thomas Skinner in Western Canada and Sirco Machinery in Eastern Canada – have been partners with Skills Canada for many years and are strong supporters of the Skills Canada National Competition. Through their partnership with SCC, these organizations work together to promote the manufacturing sector by supplying equipment, monetary awards in CNC Machining and Precision Machining to SCNC competitors and sponsorship of the Skills Canada National Competition. Recent statistics show that there continues to be a strong demand for skilled workers in manufacturing. Statistics Canada reported that there were 1.7 million manufacturing jobs in Canada in 2016 and 96% of these jobs were full time. The Skills Canada National Competition represents a great opportunity to showcase the many lucrative career opportunities that are available in the manufacturing sector. “The advances in manufacturing technology, advanced CNC machining coupled with robotics and mechatronics is reinvigorating manufacturing in North America. This is creating many higher paying desirable jobs in the STEM field as well as strengthening our economies. The Gene Haas Foundation is proud to partner with Skills Canada to not only create awareness of these opportunities but to help start young people on pathway to success,” says Kathy Looman, Foundation Administrator, Gene Haas Foundation. “The Skills Canada competitions are essential in helping create a culture of skilled trades in Canada,” says Paul Krainer, President, Thomas Skinner. Through the generous support of its multi-year sponsors and suppliers, SCC is able to promote skilled trade and technology career opportunities at SCNC. At the 2018 Skills Canada National Competition, representatives from industry, government, and labour, along with educators and youth will gather in Edmonton, Alberta. Over 550 secondary and post-secondary students will compete for the title of national champion in more than 40 skilled trade and technology contest areas. In addition, there will be over 50 interactive Try-A-Trade® and Technology activities that will give the approximately 7,500 visiting students the opportunity to learn about the various career options available to them in the skilled trade and technology sectors. The Competition serves two purposes: It showcases the variety of opportunities in the skilled trade and technology sectors; and it tests students and apprentices using industry standards configured by National Technical Committees that are comprised of industry and educational experts. “The Skills Canada National Competition profiles digital literacy and technology driven skills that are crucial to keep pace with the quickly changing job market. Through our partnership with Thomas Skinner and the Gene Haas Foundation we are able to raise awareness of these constantly changing occupations and engage the next generation of workers,” says Shaun Thorson, Chief Executive Officer of Skills/Compétences Canada. The Gene Haas Foundation is a private foundation founded by Gene Haas in 1999. Gene Haas is the owner of Haas Automation, Inc., a billion-dollar company and America’s leading builder of CNC machine tools, which he started in 1983. Growing up with a strong social conscience instilled by his family, Gene initially formed the foundation to fund the needs of the local community where his 1 million square foot manufacturing facility is located. Gene’s commitment to the importance of manufacturing has incited him to grow his personal foundation and direct his foundation board to focus on manufacturing education in the form of scholarships for CNC machinist training. Scholarship grants have given CNC training a higher profile. In addition, schools have leveraged scholarships into more funds from government for their CNC programs. Thomas Skinner is the leading Western Canadian distributor of industrial metalworking, and machine shop supplies and equipment. Founded in 1904, and with four (4) locations across Western Canada, Thomas Skinner represents a comprehensive and carefully curated range of products produced by Best in Class manufacturers of CNC (computerized numerical control) and conventional machine tools, cutting tools, precision measuring instruments, tool holders, abrasives, workholding equipment, band saws, cutting fluids and other machine shop supplies. These products are backed by Thomas Skinner’s team of dedicated, local, technical sales, service and operations professionals whose goal is to provide the highest level of aftersales support to enable its customers to be competitive and be a step ahead of today’s manufacturing challenges. About Sirco Machinery Co. Ltd.
Sirco Machinery has been a family run and leading machine tool distributor in Eastern Canada for the past 60 years. For the past 27 years, Sirco has represented Haas Automation products in Ontario, Quebec and the Maritimes. Sirco’s factory trained team provides a comprehensive list of support and engineering services for its diverse and constantly growing customer base.